During middle school, I carried a deck of playing cards almost everywhere I went. My friends and I would spend our recess and bus rides playing games like hearts, spades, egyptian rat screw, and mao—much to the consternation of our teachers who always suspected we were gambling. By high school, I’d discovered Magic: The Gathering, and soon my backpack was filled with my favorite decks. That worked out nicely when I could rely on having other Magic fans to play with, but when someone uninitiated wanted to hang out, it was a lot harder to teach them the rules than it had been to just deal them in for some mao. I’ve encountered that problem countless times since then with various card and board games that can take hours to set up, teach, and play. As fun as those games can be once they get going, the commitment you need to play them means some rarely make it off my shelf. Luckily, there are plenty of games you can teach and play in 45 minutes or less and carry around with the ease of a deck of playing cards. I first encountered Indie Boards And Cards’ Coup at Gen Con, where a friend suggested playing a few games while our Dungeon Master set up for the next Dungeons & Dragons encounter. That’s how quick of a game it is. Its small deck contains three copies of five different roles: ambassador, duke, captain, assassin, and contessa. Each player receives two cards at the start and is eliminated if they run out. The catch is, you can lie about what those cards are. Every role has its own ability, so someone who claims to be the captain can steal coins from another player, while the assassin can force someone to discard one of their cards. But in turn, someone can claim to be the ambassador for protection from theft or the contessa to ward off an assassin. If you think another player’s lying, you can call them out. If they’re caught, they have to discard one of their cards. But if you were wrong, you have to discard instead. Everyone can get a cheat sheet that lists the rules for each role, so you can easily consult it if you want to lie but can’t quite remember what another card does. The game’s rules take minutes to learn, but countless strategies develop over multiple plays. For instance, if you have two dukes and another player claims to be duke, odds are good that they’re lying. But you might want to pretend you’re considering their poker face rather than your own hand when you call them out, lest it be obvious what your cards are. Some players favor irrationality, claiming to be one role one turn and on the next, welcoming an attack that last role could have prevented just to confuse their competitors. Some players almost never lie, while other groups are so brazen that five players will claim the same role on the first turn. That high variance keeps the game unpredictable and makes it especially appealing to try with new people. Alderac Entertainment Group’s Love Letter is the fastest of these games I’ve played, with some matches ending in three actions or less. It has a complex plot involving wooing a princess by getting your declaration of love past various scheming nobles, but what it boils down to is an attempt to be the last player standing. Like Coup, Love Letter has a variety of different role cards. Each player has one in their hand at all times and picks up a new one at the start of their turn before immediately using or discarding one of the two. Only some of these have useful abilities while others are largely liabilities until the end of the game, where they will help you win ties. There is a variety of ways to make someone lose the game using different roles, like the guard, who will eliminate someone if you can guess what card they’re holding, or the baron, who will defeat someone whose card is a lower value than your own. Since the guard is the most common in the deck, any hints of what cards you might have in hand are dangerous, especially since what you’re holding becomes more obvious as the deck dwindles. The game’s basic structure is simple enough that the designers have also released versions of the game that replace the nobility with Batman and Lord Of The Rings characters. Archer and Adventure Time versions are in the works. 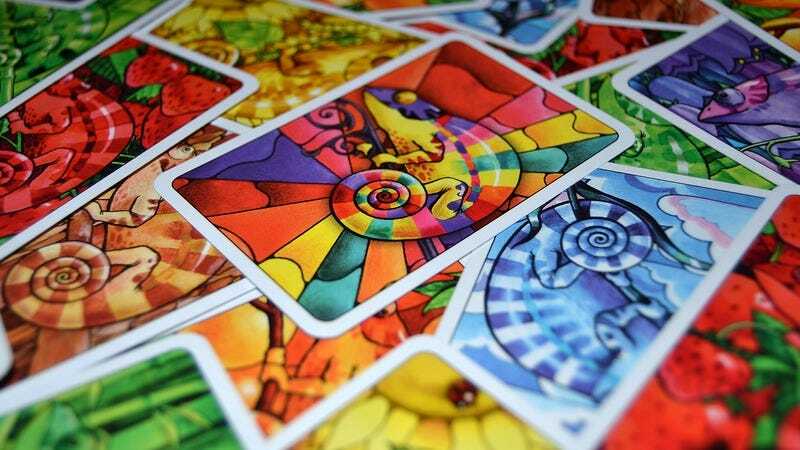 Then there’s Rio Grande Games’ Coloretto, which has players collect piles of cards depicting different colored chameleons. At the end of the game, the three colors you have the most of are worth points, while any other colors detract from your score. Depending on what version of the rules you’re playing, collecting more of the same card can be exponentially good until you max out, or you can hit a sweet spot before extra cards of the same color begin to diminish your score. Either way, you want to be cautious of what you pick up, which is challenging because the other players are all trying to stick you with cards you don’t want. Players can use their turn to either draw a card from the main deck and immediately place it face-up into one of three piles or pick up all the cards in one of those stacks. The decision involves a lot of thinking ahead. There are cards that are great no matter the situation, like wild chameleons that can take on any color or bonuses that add a flat number to your final score. Drawing one of those cards from the main deck is often terrible, since it means the next player will have the chance to scoop it up. But drawing can also give you the power to poison a pile filled with the colors your neighbor is collecting by adding a chameleon of a color that will hurt them. Piles also have a maximum number of cards they can hold, meaning it’s easy to wind up picking up things you really don’t want. The lack of text and the cheerful lizards makes Coloretto look like a game you could teach a 5-year-old, but there’s a surprising amount of long-term strategy required to plot out the actions that will help you and hurt others. Not all simple games are purely competitive. Indie Board & Cards’ The Resistance places most of the players on the same team as they go on a series of missions to undermine an evil totalitarian government. Some of the players, however, are secretly spies that want the resistance to fail. Players take turns assuming the role of squad leader, who chooses whom to arm with guns and send on the mission. Once they’ve picked, everyone votes on whether that party is acceptable. If a majority approves the group, the players on the mission then secretly vote whether they want it to succeed or fail. The game seats five to 10 players, making it ideal for parties, and it doesn’t require anyone to sit out and facilitate the way mafia (a.k.a. witch hunt or werewolf) does. Because the number of players needed for a mission changes and the resistance can only fail a certain number of times before their cause is lost, it’s impossible to triangulate who’s voting for failure. You have to weed out the spies in your midst through a mix of logic and lie detection. And because you can’t call someone out, like in Coup, the bluffing reaches another level. Most of the time spent playing the game doesn’t involve tallying votes but listening to players spin elaborate narratives about why you should trust them and why someone else is clearly a spy. My first time playing was with a group of people I didn’t know well, and one of my closer friends there claimed to know I was a spy because of his past board game experiences with me. The rest of the group bought it, but he was actually the spy and using the situation to his advantage. We laughed about it later, and the game proved a nice icebreaker, producing a kinship between teammates. Plus, you always feel like you’ve gotten to know someone better once they’ve lied to your face or you’ve had to plead with them to believe you’re telling the truth. If you’d rather avoid conflict with your friends, there’s R&R Games’ Hanabi. All the players are working toward the same goal: crafting the perfect fireworks show, represented by stacking five numbers of the same color in the correct order. Unfortunately the fireworks have all gotten mixed up and your honor dictates you can’t check your own work. Seriously, that’s the plot. That means each player can look at everyone else’s hand, but not his or her own. Each turn, you can either play a card on a pile, discard a card for a hint that another player can use in the future, or tell another player something about their cards, such as which ones are red or that a particular card is a 5. The players lose if they make too many mistakes or the deck runs out. That latter condition means there aren’t enough turns to make all your decisions with perfect information. Some actions have to be taken with the hope that, if you were about to ruin everything, one of your fellow players would have warned you. If you want to succeed, you’ll pick up strategies like default ways of playing your cards or coming up with hints that inform one player while prodding their neighbor to act in a certain way. When the ability to give advice is limited, the goal is to convey as much as possible when you can. The rules limiting hints can be a problem, though, since they inherently constrain the table talk that’s a fun part of any game and can frustrate new players who aren’t able to receive much help from their veteran partners but can still cause the entire team to fail. This is far from a comprehensive list—just a peek at some of the complexities that game developers have managed to pack into small boxes. Even if you do prefer games with lots of pieces that unfold over the course of hours, carrying around a simple game or two can help pass the time while you set up for the main event.